I have written an article on ionized alkaline water to share my personal experience on this subject. 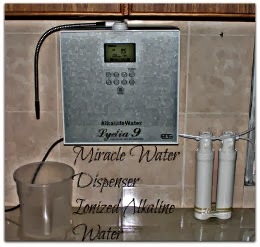 You can read it by clicking this link : http://goodguy.hubpages.com/hub/Is-Alkaline-Water-Or-Ionized-Water-Effective. In this post I wish to "copy&paste" two write-ups by two opposing experts on the subject of alkalinity in our body. The first writer insists that whatever goes into our stomach will be turned to acidic before passing through the intestine, which means that it is useless to drink alkaline water which will be turned into acidic. The other write-up explains how our body will become less acidic when we drink alkaline water. Whatever the experts may say, my opinion is that the most important factor is whether the ionized alkaline water really works on people who have taken it. The best place to look for this is from personal testimonies from people you know who have benefited from taking this alkaline. My elder sister and my wife have benefited from drinking the ionized alkaline water. So my two sisters and I have installed the water ionizer appliance. My wife's sister and a cousin have also followed suit. Ok, below are the two "copy&paste" write-ups. Have you seen advertisements for products such as coral calcium or alkaline water that are supposed to neutralize acid in your bloodstream? Taking calcium or drinking alkaline water does not affect blood acidity. Anyone who tells you that certain foods or supplements make your stomach or blood acidic does not understand nutrition. You should not believe that it matters whether foods are acidic or alkaline, because no foods change the acidity of anything in your body except your urine. Your stomach is so acidic that no food can change its acidity. Citrus fruits, vinegar, and vitamins such as ascorbic acid or folic acid do not change the acidity of your stomach or your bloodstream. An entire bottle of calcium pills or antacids would not change the acidity of your stomach for more than a few minutes. Dietary modification cannot change the acidity of any part of your body except your urine. Your bloodstream and organs control acidity in a very narrow range. Anything that changed acidity in your body would make you very sick and could even kill you. Promoters of these products claim that cancer cells cannot live in an alkaline environment and that is true, but neither can any of the other cells in your body. All chemical reactions in your body are started by chemicals called enzymes. For example, if you convert chemical A to chemical B and release energy, enzymes must start these reactions. All enzymes function in a very narrow range of acidity. (The degree of acidity or alkalinity is expressed as "pH."). If your blood changes its acidity or alkalinity for any reason, it is quickly changed back to the normal pH or these enzymes would not function and the necessary chemical reactions would not proceed in your body. For example, when you hold your breath, carbon dioxide accumulates in your bloodstream very rapidly and your blood turns acidic, and you will become uncomfortable or even pass out. This forces you to start breathing again immediately, and the pH returns to normal. If your kidneys are damaged and cannot regulate the acidity of your bloodstream, chemical reactions stop, poisons accumulate in your bloodstream, and you can die. Certain foods can leave end-products called ash that can make your urine acid or alkaline, but urine is the only body fluid that can have its acidity changed by food or supplements. ALKALINE-ASH FOODS include fresh fruit and raw vegetables. ACID-ASH FOODS include ALL ANIMAL PRODUCTS, whole grains, beans and other seeds. These foods can change the acidity of your urine, but that's irrelevant since your urine is contained in your bladder and does not affect the pH of any other part of your body. When you take in more protein than your body needs, your body cannot store it, so the excess amino acids are converted to organic acids that would acidify your blood. But your blood never becomes acidic because as soon as the proteins are converted to organic acids, calcium leaves your bones to neutralize the acid and prevent any change in pH. Because of this, many scientists think that taking in too much protein may weaken bones to cause osteoporosis. ─ exercise and rest, diet, etc ─ YES ! Among the people who question the validity of alkaline water, the biggest question is, "What happens to the alkaline water once it reaches the stomach, which is highly acidic?" People who have some knowledge of the human body, including medical doctors, ask this question. Let me answer that question once and for all to erase any doubts about the health benefits of alkaline water. When the stomach pH value gets higher than 4, the stomach knows what to do to lower it. However, if the pH value goes below 4, for any reason, the stomach doesn't know what to do. That's why we take Alka-Seltzer, which is alkaline, to relieve acidic stomach gas pain. In this case, hydrochloric acid is not produced by the stomach wall, therefore, no alkaline buffer is being added to the blood stream. Let me give you another example of a body organ that produces acid in order to produce alkaline. After the food in the stomach is digested, it must come out to the small intestine. The food at this point is so acidic that it will damage the intestine wall. In order to avoid this problem, the pancreas makes alkaline juice (known as pancreatic juice). This juice is sodium bicarbonate, and is mixed with the acidic food coming out of the stomach. From the above formulae, in order to produce bicarbonates, the pancreas must make hydrochloric acid, which goes into our blood stream. We experience sleepiness after a big meal (not during the meal or while the food is being digested in the stomach), when the digested food is coming out of the stomach; that's the time when hydrochloric acid goes into our blood. Hydrochloric acid is the main ingredient in antihistamines that causes drowsiness. Sang Whang is an engineer, scientist and inventor with many U.S. patents. His fields of expertise span many different areas such as data communication devices (modem), electronic filters, chemistry, water, cornea measuring devices, multi-focal soft contact lenses, etc. An improvement and maintenance of his own health caused him to investigate the phenomenon and led him to the discovery of his theory of Reverse Aging. He wrote the best selling book “Reverse Aging” in 1990 which has since been translated to Spanish, Polish, Chinese, German, Italian, Japanese, Korean, and Russian.